The lunar landing site is the site where the Apollo 11 Lunar Lander landed on the Moon in 1969. By the year 3000 it has been lost for centuries, and Earthicans believe that the "Whalers on the Moon" were the first to arrive on the moon. The writers realised that when the original Apollo crew took off, only the descent module of the lander had remained. 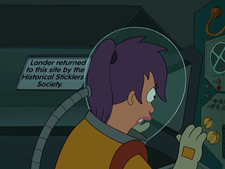 That's why a sign inside of the Lunar Lander that Fry and Leela enter explains why it was returned. However this is in contrast with Nixon saying that he staged the moon landing on Venus. 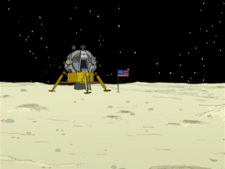 The Historical Sticklers Society thought that the lunar lander landed on the moon, as for the flag and footprints, the Historical Sticklers Society put those there too. This page was last edited on 8 September 2013, at 16:11.